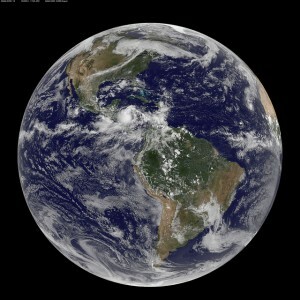 NASA/NOAA GOES 13 satellite image showing earth on September 24, 2010 17:45 UTC. Credit: NOAA/NASA GOES Project NASA Goddard Space Flight Center enables NASA’s mission through four scientific endeavors: Earth Science, Heliophysics, Solar System Exploration, and Astrophysics. Goddard plays a leading role in NASA’s accomplishments by contributing compelling scientific knowledge to advance the Agency’s mission. NASA/NOAA GOES 13 satellite image showing earth on September 24, 2010 17:45 UTC.